Find fun things to do in Other, MI. View our list of attractions, activities, events, restaurants and visitor information. Murder Mystery Dinner Train Top Attraction! Old Road Dinner Train Fun! Hidden Lake Gardens & Conservatory Top Attraction! Historic Croswell Opera House Top Attraction! Michigan Renaissance Festival Top Attraction! Great Lakes Shipwreck Museum Top Attraction! On the shore of the shipwreck coast, the museum campus includes Whitefish Point Lighthouse, a restored 1923 Surfboat House, Coast Guard Crew Quarters, and exceptional exhibits. Deceivingly beautiful Lake Superior's unrelenting fury has earned the reputation of being the most treacherous of the Great Lakes. Throughout the museum comples, visitors will see maritime legends come to life. 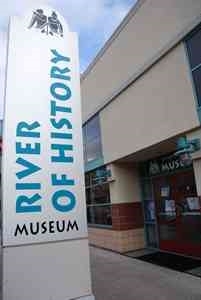 River of History Museum Top Attraction! Experience the area's history from the river's glacial origin, through Native American settlement, French fur trade, British and American expansion, to the present day. Its location may be new, but the River Of History Museum continues to do what it does best: explain and interpret the region's story from its earliest recorded history. Tower of History Top Attraction! At 210 feet above the twin Saults, the Tower Of History is easy to locate on Portage Avenue. Four viewing platforms atop the Tower Of History's concrete structure reveal spectacular panoramic views of international proportion. Step onto the open air decks or glassed observation areas and watch as the St. Mary's River and Canada unfold before you. 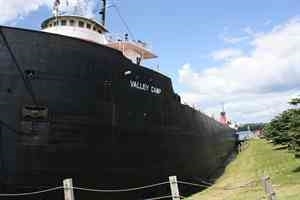 Museum Ship Valley Camp Top Attraction! Visit this retired freighter and explore the pilot house, crew quarters, and cargo holds. Launch your tour of the Soo from this retired cargo freighter at the river's edge. 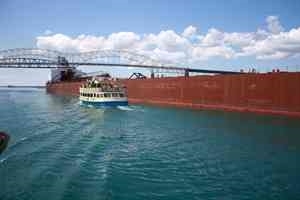 Soo Locks Boat Tours Top Attraction! Experience locking through the Soo Locks. Your narrator will explain the history and operation of the Locks as your boat is raised 21 feet, straight up, to the level of Lake Superior. After your downbound lockage, enjoy a cruise along the historic waterfronts of Michigan and Canada. See all four U.S. Locks, St. Steam Railroading Institute Top Attraction! The Steam Railroading Institute is an interactive museum depicting steam-era railroading and its impact on the culture and of the Great Lakes Region. The institute is home to the majestic Pere Marquette No. 1225, the largest operating steam locomotive of its kind. Durand Union Station & Michigan Railroad History Museum Top Attraction! The Durand Union Station recaptures the golden years of railroading. The Michigan Railroad History Museum features photos, artifacts, displays and articles of Durand's rich railroad history. Exhibits are changed several times throughout the year. Bay City Antiques Center/downtown Antiques Market Top Attraction! This 3-story historic building houses an unparalleled selection of antiques and collectibles. 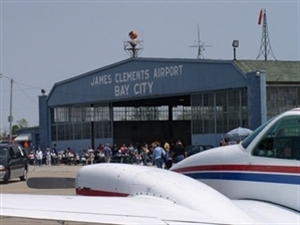 They operate in conjunction with Bay Antique Center, Michigan's largest antique mall, located on the same street. Pancake Beakfast Dawn Patrol Fly-in Pancake Breakfast served by Krzysiak’s House Restaurant. Cost o $8.00 for Adults, $5.00 for Children 5-10, 5 and under Free. Skydivers, Aircraft, and many more displays. Barrel Plane rides for Children at no charge. Sail aboard the Appledore tall ships in the Saginaw Bay Located on the Saginaw River in downtown Bay City, and just a short transit from the Saginaw Bay and Lake Huron, Bay Sail offers a regular schedule of public sails aboard the Appledore IV & Appledore V tall ships. Canoe & Kayak rental on the beautiful AuSable River. With it’s gently flowing current, the AuSable River is an excellent choice for both beginner and experienced canoeists. Day trips range from 2 1/2 to 5 1/2 hour or choose a two to five day camping trip. 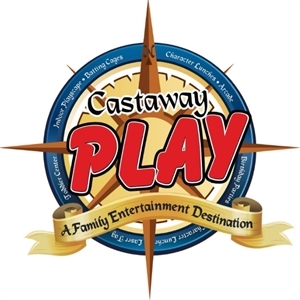 Family Fun Entertainment Castaway Play Cafe is a family entertainment and amusement center that is fun for all ages. Children love to play and climb on the largest indoor play structure in Michigan or bounce on one of the many bounce houses at Castaway. Charlevoix welcomes the arrivals of the summer season! 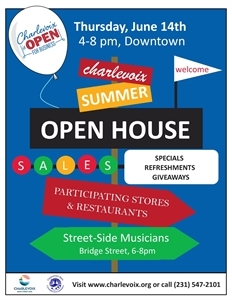 Charlevoix merchants are celebrating the arrival of the summer season with the 7th Annual Welcome Back Summer Open House. 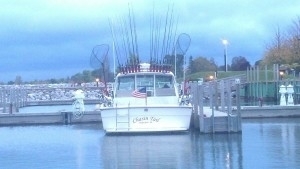 We offer Charter Fishing in Mackinaw City, Michigan, Mackinac Island, St. Ignace, Cheboygan, MI and norther Lake Huron. Salmon Fishing,Lake Trout, Steelhead and more. Great Charter Fishing Rates. We have been fishing Lake Huron for over 35 years. 5K run, 5K walk, 10K run The 11th annual Dirty Dog Trail Run is for runners of all skill levels to run with or without their dogs. The course is a combination of unpaved two-track and single track trails that twist and turn over flat land and hills in the scenic woods of Midland City Forest. 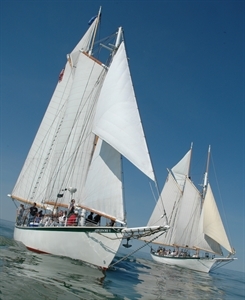 Sail aboard a tall ship on the beautiful Tawas Bay! For a limited time only, the schooner Appledore V makes her way to East Tawas, Michigan for the second annual Heritage Coast Sail Days! Set sail aboard this 65-ft. tall ship on the beautiful Tawas Bay of Lake Huron.